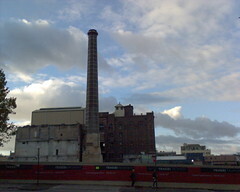 The few remaining buildings and chimney of the former Carlton United Brewery on Broadway, Chippendale. It was interesting to come back to Sydney after a year, and find the space opposite UTS raised to the ground. An expanse of open space, and this one tall chimney. I see that this project has been coming along for some years. And that it is intended to be a green urban renewal project. It will be interesting to see what it looks like when finished, in 6 to 8 years. But for now it is nice to have a little more open space so close to Sydney CBD. This entry was posted in Photos, Uni and tagged Broadway, demolition, underconstruction, UTS. Bookmark the permalink.